RENO, NV APRIL 27, 2011 Torchmate Racing JT Taylor will be driving #4413 and Jesse Haines will be driving #4499 at the Best in the Desert Bilek Silver State 300 race this weekend in the commonly known Ultra4 class which will be the largest class at this years Silver State event. Mike Shaffer will be running the Torchmate racing #1066 Class 1000 car. The race will start in Alamo, Nevada about 95 miles north of Las Vegas on Saturday April 30th. The Aliante Casino & Resort will host the race events and tech and inspection on Friday. 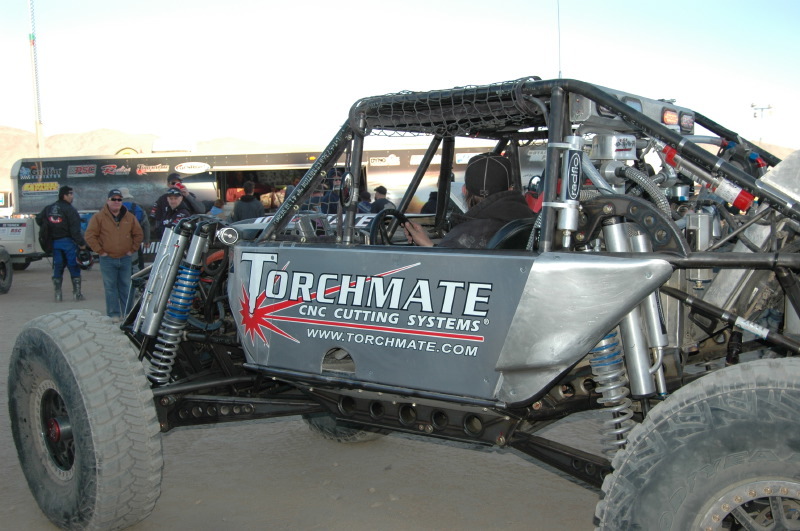 JT Taylor, Torchmate Racing Manager and Driver, will be driving the #4413 Ultra4 car with co-driver Shannon Powell. This is the second race this car has competed in, the unveiling being at the Griffin King of the Hammers in February. “We have put on over 100 miles on the new car testing and all appears to be ‘a go’ for an extremely fast and competitive race this weekend,” said Jake Povey, Torchmate Racing Crew Chief. Jesse Haines will be racing his #4499 buggy with Chris Keiker as co-driver. Haines recently finished the 2011 King of the Hammers with minutes to spare. “We are ready to race and looking forward to getting another race under our belt in the Ultra4 Series,” said Haines. The race winds through some of the most beautiful desert Nevada has to offer. However beautiful it may be, it will provide for some hairy situations with terrain for a very challenging race. The weather will be a springy 80 degrees with wind to clear the course of dust, or reek havoc depending on the direction. To follow the Torchmate racers this weekend, check for live race updates on www.facebook.com/torchmateracing and track each of their progress at http://www.racetheworld.net. For more information on all the racers go to www.torchmateracing.com.